In late July, I stumbled my way into the KW Institute for Contemporary Art, in search of the press entry into the tenth edition of the Berlin Biennale without a press badge or any official credentials, but with a student ID (useless) and a vague professional email I had forgotten to respond to from a press representative of the exhibition (useful). I had never intended to attend an international contemporary art biennial—much less write on, or be granted free entry, into one. I was working three jobs in New York City (two arts institutions, one service), and happened to be dating the cousin of an international flight attendant. The stars aligned, offering myself and my partner a round trip to Europe for $100, and a chance to attend an organized event that I—a seemingly aware “arts” patron—was entirely unaware existed. 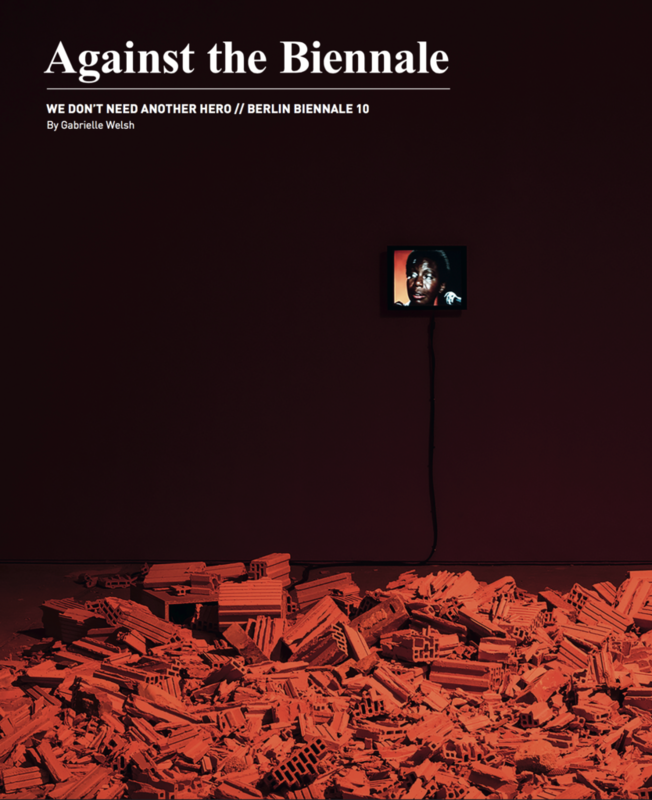 Thus, I had accidentally found myself assigned to write a review on the beautifully titled We Don’t Need Another Hero: The 10th Berlin Biennale for Contemporary Art. As it is known, the structure of a biennale presents a challenge to any curator attempting to humanize a viewing experience: these unnatural (find a ‘natural’ viewing experience of contemporary art) products of globalized art and capital necessitate wealthy donors and patrons, with the “common viewer,” either nowhere to be found or snuck into a tokenized group. With extreme hesitation, I approached this piece and every aspect of it—attending a biennale, giving up a couple of my much-needed vacation days to view art, enjoying something in my mind that was so corrupted—and was surprised. Incredibly surprised. Grada Kilomba, ILLUSIONS Vol. 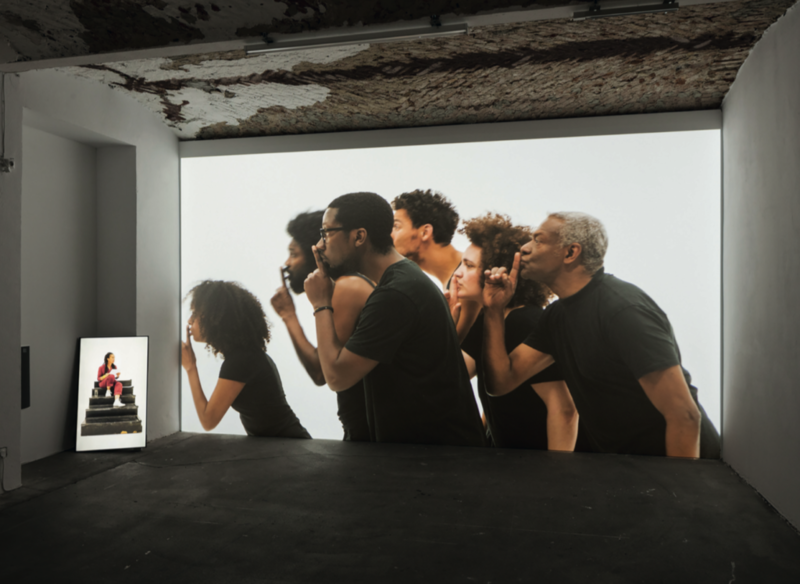 II, OEDIPUS, 2018, 2-channel video, color, sound, 32′, Installation view, KW Institute for Contemporary Art, Berlin, courtesy Grada Kilomba; Goodman Gallery, Johannesburg/Cape Town, Photo: Timo Ohler. The sheer scale of the Biennale is impressive; spread across four venues (Akademie der Künste, KW Institute for Contemporary Art, the Volksbühne Pavilion, and ZK/U – Center for Art and Urbanistics), the exhibition includes fifty contemporary artists whose work was both commissioned and selected for exhibition. So, in an attempt to draw away from its undeniable subject as an international art venue, the radical approach of this exhibition to curation was refreshing. Yet, the question remained: what was the merit to working with these institutions, as opposed to against them? Walking into the KW Institute for Contemporary Art and into the first floor, immediately one is hit with a massive installation: Dineo Seshee Bopape’s Untitled (Of Occult Instability) [Feelings] (2016–18). Bopape’s piece takes over the bottom floor of the KW and contains multiple pieces within itself— Jabu Arnell’s Discoball X (2018), Lachell Workman’s Justice for _____ (2014), and Robert Rhee’s EEEERRRRGGHHHH and ZOUNDS (2015). The installation includes bricks, light, sounds, videos, and more, changing the exhibition space into a collapsed pile of rubble—the room is a deep orange, piles of material lay strewn across the floor next to high definition video screens, and water drips from the ceiling into buckets. Examining the relationship between mental illness (insanity) and the colonized body, Bopape has created a space of uncertainty and confusion. In the back corner, a small screen plays Nina Simone’s 1972 performance of Feelings, though her voice is heard throughout the space, slightly out of sync with her lips. The experience is odd, and lays the foundation for the rest of the Biennale—the viewer is not given an out-right explanation of what to do with this information, but instead must face the wreckage. Grada Kilomba’s work, entitled ILLUSIONS Vol. II, OEDIPUS (2018), tucked away in a corner of the KW, proves to be one of the most important pieces within the Biennale. The Berlin-based artist has been working on their ongoing ILLUSIONS series since 2016, with this iteration commissioned specifically for the exhibition. The films visualize and narrate episodes in Greek mythology, all the while teaching lessons of decolonization and oppression. ILLUSIONS Vol. 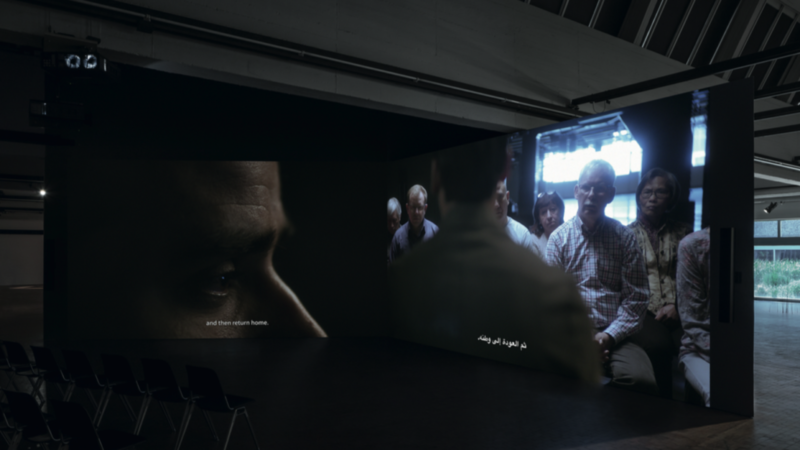 II, OEDIPUS retells the story of Oedipus; with two screens facing each other, the artist cements her place as storyteller on one, while actors follow along on the larger projection opposite. 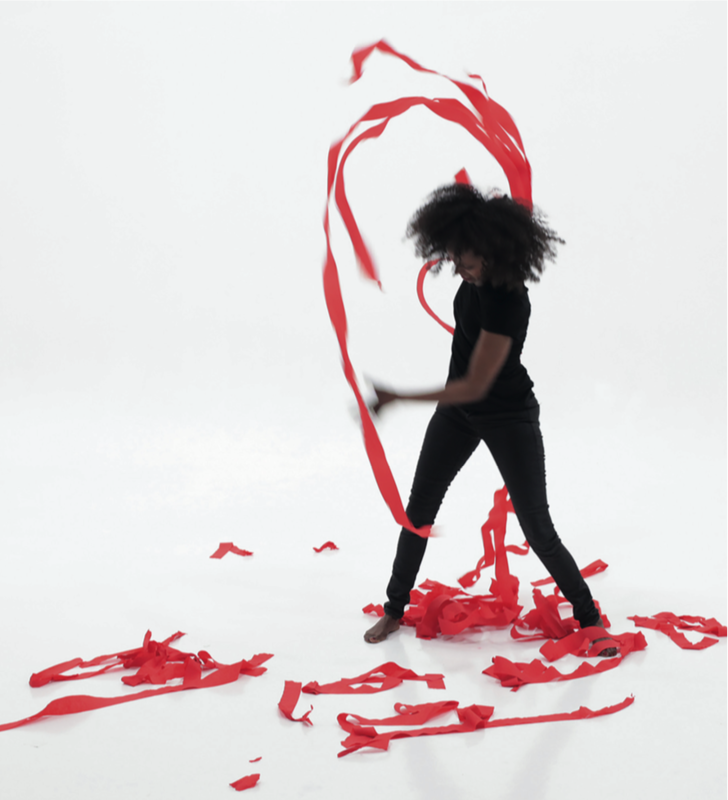 In many instances, the pairs face each other, or Kilomba joins the cast in the story, playing secondary characters in the tragedy she retells. The cast of actors illustrate the tragedy of Oedipus with a warm-hearted knowing—you get the sense that these actors are comfortable with each other, as moments of pure joy envelop the screen. The genius of the work is one that remolds a Classical treasure into a comprehensible lesson, with Kilomba appearing at the end to spell out the exact metaphor she wishes to make. For once, an artist’s intention cannot be questioned or debated, as she tells you (the viewer) that this story can (and is being) interpreted as a story of father/son rivalry, one that is elevated within black communities. Again, the viewer given neither a call to action, nor anything to do with the information, but instead there exists the work, as a space for reflection that is open. Mario Pfeifer, Again / Noch einmal, 2018, 4K video transferred to HD, 2-channel installation, color, 5.1 Surround, 23′, installation view, 10. Berlin Biennale, Akademie der Künste (Hanseatenweg), Berlin, courtesy Mario Pfeifer; KOW, Berlin, © 2018 VG Bild-Kunst, Bonn, photo: Timo Ohler. Fast- forward to another venue at the Akademie der Künste. Though it was Summer, and quieted from any students, the Akademie hosted a significantly sized portion of the exhibition. As one of the main exhibition venues, the Akademie contains perhaps the best example of mixing alternative modes of pedagogy and art that I have ever encountered, in line with Ngcobo’s vision of We Don’t Need Another Hero as being a space for learning, community, and ultimately, of collectivity. Mario Pfeifer’s film, Again / Noch einmal (2018) was an experience not easily forgotten—within the work, the Berlin-based artist recreates a well-known media story in Germany, in which a young man was dragged out of a grocery store in Eastern Germany by a “vigilante group” after he was reportedly threatening customers. The man, an Iraqi migrant seeking medical attention in Germany, was then tied to a tree, and left for police to deal with. In a country where xenophobia has exponentially increased, the story garnered both national outcry and support, with many blaming the victim. As the trial date neared, the man was unable to testify, as he was found dead in the woods—frozen to death and suffering from physical and mental illness (which is then explored further in the film). The general feeling throughout the Biennale was one of contempt towards art and its histories, while simultaneously existing within its same institutional spaces. Perhaps We Don’t Need Another Hero illustrates some of the ways this can be attempted, but it is hard not to forget the massive state and corporate funding that went into the inception and production of the exhibition. Would it make sense if I told you that I, perhaps felt this sense of collectivity that the curatorial staff was most trying to achieve once I was outside of the Biennale, reflecting on what I saw, heard, participated in? Would it make sense that I felt this collectivity—this against the “Thunderdome”— when I was dancing in a queer club to an American DJ remixing Tina Turner while young Germans clad in leather danced all around me? Would it make sense, that perhaps the best way to feel this collective joy, a community, is to feel it in a real space? And not a biennale? We Don’t Need Another Hero: The 10th Berlin Biennale for Contemporary Art ran until September 9, 2018. Ncobo, Gabi and Mutumba, Yvette. 10. Berlin Biennale Für Zeitgenössische Kunst. DISTANZ Verlag, 2018. “Berlin Biennale for Contemporary Art.” E-flux. Accessed September 06, 2018. Ncobo, Gabi and Mutumba, Yvette. 10. Berlin Biennale Für Zeitgenössische Kunst. DISTANZ Verlag, 2018. p 40. “Federal Criminal Police Office Warns of Xenophobic Violence” Deutsche Welle. October 22, 2015. Accessed September 06, 2018. September 26, 2018 | Filed under Art Seen: International and tagged with 10th Berlin Biennale, Mario Pfeifer, We Don't Need Another Hero.